This week, the Census Bureau released its report on incomes, earnings, and poverty rates for 2016. Most analysis paid particular attention to the changes between 2015 and 2016. We wanted to take a deeper look at earnings by race and gender over a longer period of time—since 2000—to paint a more complete picture of what has happened over the last full business cycle (2000-2007) plus the most recent recession and recovery (2007-2016). Since 2000, wages have been generally stagnant, and large gaps persist by race and gender. This longer-term trend might at least partially explain the less-than-rosy outlook many working people seem to have about the economy and their personal economic security—despite ongoing progress toward a full economic recovery. To a great extent, trends in annual earnings since 2000 resemble the overall wage stagnation we’ve seen since the mid-1970s. (Here, we discuss annual full time earnings, but the long-run trends are consistent with the hourly wage data. For an extensive discussion of hourly wage trends, see The State of American Wages 2016.) Between 2015 and 2016, men’s earnings fell slightly, and are still 0.6 percent below their 2000 level. Meanwhile, women’s earnings increased slightly, and are now 8.5 percent higher than in 2000. Because of these divergent trends, the overall gender wage gap narrowed between 2000 and 2016, though at a slower rate than in the previous two decades. These patterns in men’s and women’s full-time median annual earnings can be further broken down by race. 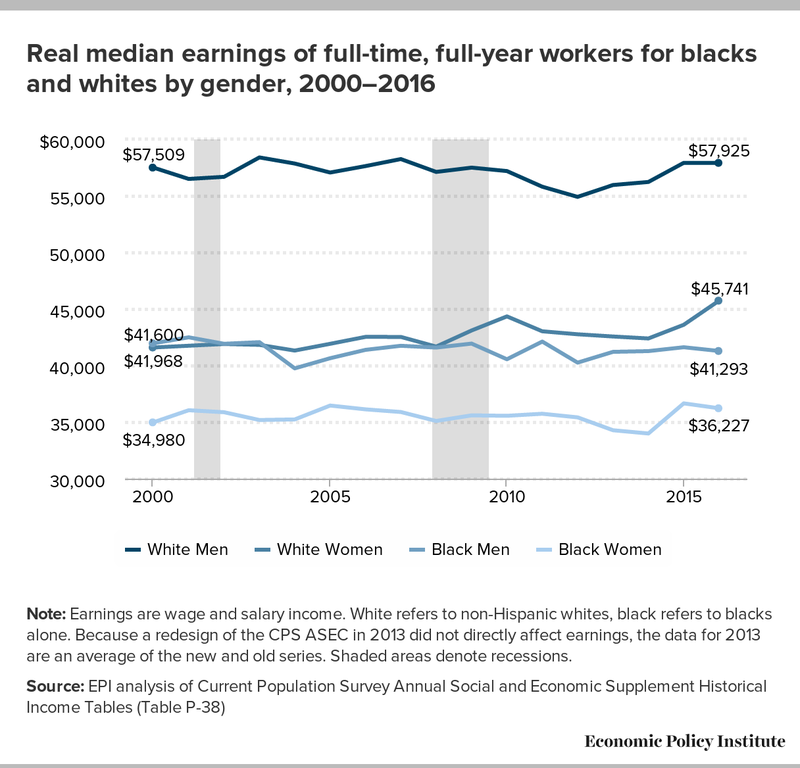 As you can see in the figure below, real median earnings of full-time workers—male and female, black and white—have been relatively flat since 2000. While all four groups experienced an increase between 2014 and 2015, along with impressive gains across-the-board in 2015, only white women saw their median wages rise between 2015 and 2016. For the most part (except for white women), median wages were flat or falling in the full business cycle of 2000–2007, and have yet to significantly grow past their 2000 levels. Note: Earnings are wage and salary income. White refers to non-Hispanic whites, black refers to blacks alone. Because a redesign of the CPS ASEC in 2013 did not directly affect earnings, the data for 2013 are an average of the new and old series. Shaded areas denote recessions. Stagnant median wages are not desirable or inevitable. There has been substantial overall economic growth since 2000, and a growing economy has the potential to increase wages and improve living standards across the board. Unfortunately, as with the decades leading up to 2000, overall economic growth has not translated into rising wages for the vast majority of workers. 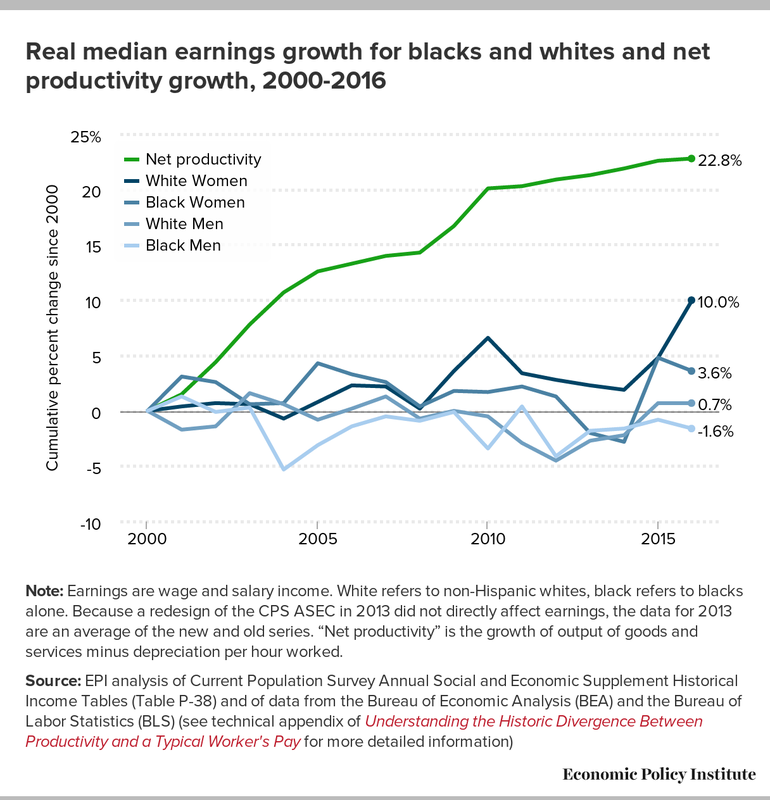 The figure below illustrates the growth in real median earnings for black and white, male and female full-time workers between 2000 and 2016, and provides a benchmark for possible growth: productivity over the same period. Productivity growth—the growth of output of goods and services produced in an average hour of work—is a good representation of how the expanding economy could translate into broad-based wage growth. As you can see, productivity grew nearly 23 percent over this period of wage stagnation, even despite the recent sharp slowdown. Yet, even white women, who had the strongest median wage growth in this figure, saw their wage grow less than half as fast as productivity. Note: Earnings are wage and salary income. White refers to non-Hispanic whites, black refers to blacks alone. Because a redesign of the CPS ASEC in 2013 did not directly affect earnings, the data for 2013 are an average of the new and old series. “Net productivity” is the growth of output of goods and services minus depreciation per hour worked. While the vast majority of workers missed out on the gains from growing productivity, those at the top reaped the rewards. You can see that pulling apart most distinctly in hourly wage data, which allows an examination of the top 1 percent. Between 1979 and 2015, wages for the top 1 percent of earners increased 157 percent, while wages for the bottom 90 percent only grew 21 percent. This rising inequality has a clear cost. We should consider it a public policy failure if working people’s wages don’t grow alongside the overall economy. Between 1947 and 1973, they did. They can again. While wage growth for most people has been stagnant or slow at best, there are also stark disparities by race and gender. Readily apparent from the first figure in this post is how much higher median earnings are for white men than any other group. Black men and white women’s salaries were about even until a mild but persistent divergence in 2010 and another in 2016. Black women’s salaries are entirely and persistently below the other groups displayed. 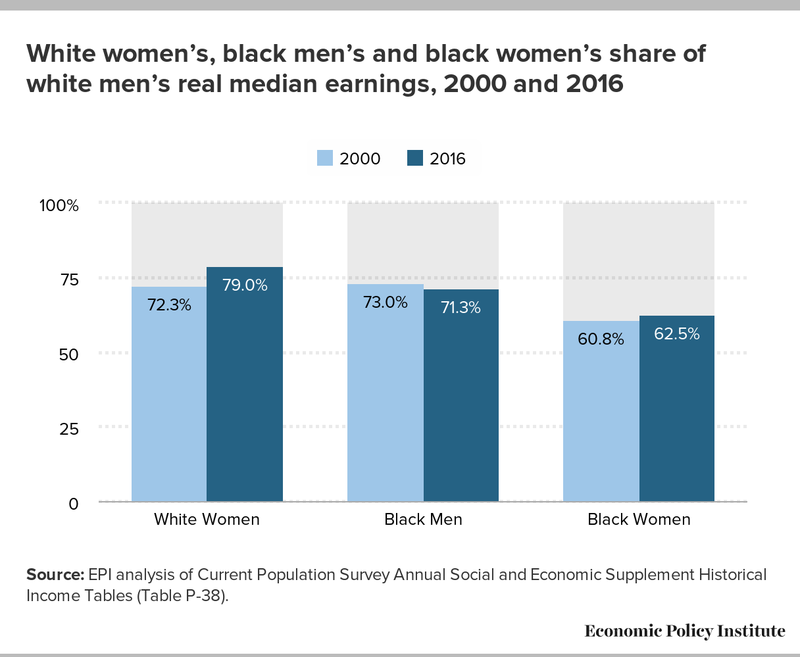 In the figure below, we explicitly examine these differences by showing median earnings for white women, black men, and black women as a share of white men’s median earnings. Of these three groups, only white women have seen any significant progress since 2000 narrowing the gap with white men. And, on an annual basis in 2016, white women were still only paid 79.0 cents on the white male dollar. Source: EPI analysis of Current Population Survey Annual Social and Economic Supplement Historical Income Tables (Table P-38). Black men’s median earnings started out in 2000 essentially where white women were vis-à-vis white men (73.0 percent versus 72.3 percent). While white women made some progress, the gap between white and black men’s earnings actually grew, albeit slightly. In 2016, black men were paid only 71.3 cents on the white male dollar. Meanwhile, in 2000, black women were paid 60.8 cents on the white male dollar, and by 2016, this only rose to 62.5 cents on the dollar. This means that there has been no progress on closing racial pay gaps since 2000, and the narrowing of the gender pay gap has been largely to the benefit of white women, a finding that is consistent with previous research on hourly wage gaps. These findings suggest that sustained and meaningful progress toward closing persistent disparities in pay by race and gender has been hindered by at least two barriers: failure to make significant and consistent progress in ending the pay gaps between white men and other workers, and failure of wages for the vast majority of workers of any race to even come close to keeping pace with productivity growth. Policymakers should attack both of these failures. At a minimum, full enforcement of anti-discrimination laws, aided by greater pay transparency, should be pursued to dent wage gaps by race and gender. And to close gaps between overall productivity and wages for the vast majority, elements of EPI’s Agenda to Raise America’s Pay should be adopted. Mending the broken link between productivity and pay for the vast majority will not only raise wages across-the-board, it will also bring an end to the zero-sum logic that has pitted working people against each other in recent decades. So long as everyone’s wages were stagnant, progress for any particular set of workers could only come at others’ expense. An economy that sees the entire bottom 90 percent rise smartly can both rapidly close gaps between workers while giving everybody a raise.